Chelsea recaptured the Premier League title in emphatic fashion as Wigan Athletic were thrashed at Stamford Bridge. Carlo Ancelotti's side needed victory to end Manchester United's three-season reign as champions - and once Nicolas Anelka gave them the lead after only six minutes there was never any doubt they would reclaim the crown. Chelsea were then able to put the gloss on their triumph with another dazzling display of attacking football that ensured Ancelotti's first season in England ended with the biggest domestic prize in his grasp. After putting seven past Sunderland, Aston Villa and Stoke City in a season that has seen them score more than a century of goals in the league, they celebrated by going one better against Roberto Martinez's hopelessly outclassed side. The thumping win is the biggest in their 105-year history and also saw them break the record for the most league goals in a Premier League season with 103. The previous best was the 97 Manchester United scored in the 1999/2000 season. Wigan's cause was not helped by the first-half dismissal of defender Gary Caldwell. He was sent off for a foul on Frank Lampard that led to the England midfield man effectively wrapping up the title from the spot before half-time. The second half was exhibition stuff with Salomon Kalou and Anelka on target again before Didier Drogba added the Golden Boot to Chelsea's title with a rapid-fire hat-trick to take his total to 29 in the league this term. Ashley Cole's crisp strike for number eight on the stroke of full-time provided a fitting finale. Chelsea's celebrations were suitably flamboyant - a reflection of their delight at ending the Old Trafford spell of supremacy in league combat. It also marked a personal triumph for Italian Ancelotti, brought to Stamford Bridge by owner Roman Abramovich to redefine the style of Chelsea's team and put them back among the major trophies. Chelsea's feat in becoming the first top-flight team to score 100 goals in the league since Spurs in 1963 was a reflection of the attacking intent Ancelotti has brought, especially on home territory. The ghost of Jose Mourinho, who won the league in 2005 and 2006 to end a 50-year barren spell, may not be banished completely, but Ancelotti has made an indelible mark. He was loudly acclaimed by Chelsea's fans throughout the second half - and let his normally impassive mask slip as he responded with a fierce clenched-fist salute to an ecstatic Stamford Bridge. 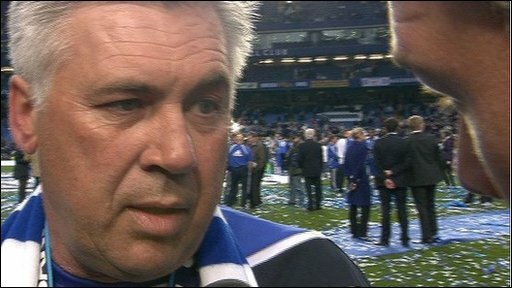 And Ancelotti can now set his sights on history as Chelsea go in search of their first league and FA Cup double when they face Portsmouth at Wembley next Saturday. For now, however, the Premier League title will do for starters and the respect for Ancelotti was obvious in the way his players and staff raced to embrace him at the final whistle. Chelsea's early nerves - if indeed there were any - were settled as Anelka put them on the way to the title after only six minutes. Wigan failed to clear Drogba's free-kick and when Florent Malouda, from a suspiciously offside position, chested the ball into Anelka's path he drilled a finish past Mike Pollitt at his near post. Despite Wigan enjoying plenty of possession and territory without posing any serious threat to Petr Cech's goal, Chelsea scored the second goal that sealed their title win 13 minutes before half-time. Lampard raced on to Drogba's flick and was hauled down by Caldwell as he closed in on goal. The Wigan defender was shown the red card by referee Martin Atkinson and Lampard scored from the spot with his customary expertise. As Stamford Bridge celebrated there was one unlikely dissenter in the shape of Drogba, who appeared unhappy that he had not been allowed to take the penalty as he battled with Manchester United's Wayne Rooney for the Golden Boot. It was a huge over-reaction from the superbly gifted, but on this evidence high-maintenance, striker - with Lampard rightly reasoning the title still needed to be won and came before personal honours. Chelsea emerged early for the second half and went into a team huddle, before putting their stamp on the title in superb style. Kalou banished any lingering doubts that this would not be a day of celebration for the west Londoners when he exchanged passes with Lampard before beating Pollitt. And two minutes later Anelka started to put the gloss on another goal glut with a perfect right-foot volley from Branislav Ivanovic's cross. It was the signal for Ancelotti to send on Joe Cole for what might have been his final Stamford Bridge appearance as a Chelsea player, with a new contract still unsigned. No team has been as ruthless as the Blues at punishing stricken opponents, and they set about putting Wigan to the sword as the home fans revelled in the slaughter. Drogba finally got the goal he so obviously craved when he headed Chelsea's fifth from Lampard's cross - their 100th league goal this season. The Ivorian striker was at it again for number six after 68 minutes when he finally got to take a penalty after Mario Melchiot fouled Ashley Cole. Lampard stood to one side as Drogba scored via a post - followed by elaborate celebrations that even involved a touchline hug for Ancelotti. And they made it another seven-goal show with 10 minutes left as Drogba turned home from close range after Pollitt could only parry Joe Cole's shot. If the game required the perfect finish, Ashley Cole provided it with a low finish past the shell-shocked Pollitt - before joyous scenes engulfed Stamford Bridge at the final whistle. 90:00+2:41 The final whistle goes and the game is over. 90:00+1:48 Didier Drogba produces a right-footed shot from the edge of the box and misses to the right of the target. 89:51 Assist on the goal came from Joe Cole. 89:51 GOAL - Ashley Cole:Chelsea 8 - 0 Wigan Goal scored by Ashley Cole from deep inside the penalty area to the bottom left corner of the goal. 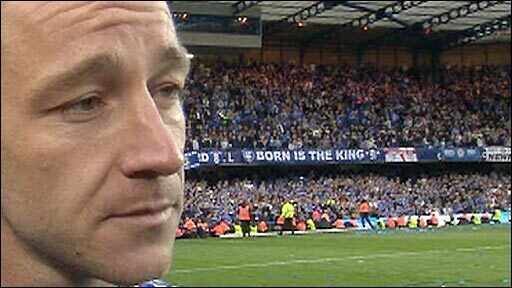 Chelsea 8-0 Wigan. 88:26 Inswinging corner taken right-footed by Victor Moses, Nemanja Matic makes a clearance. 85:58 Corner taken by Charles N'Zogbia, Florent Malouda makes a clearance. 85:38 Shot by Victor Moses. Save made by Petr Cech. 85:21 A cross is delivered by Didier Drogba, Maynor Figueroa makes a clearance. 83:41 Nemanja Matic concedes a free kick for a foul on Paul Scharner. Direct free kick taken by James McCarthy. 82:47 Charles N'Zogbia is ruled offside. Petr Cech restarts play with the free kick. 81:12 Florent Malouda takes a shot from just inside the penalty box which clears the crossbar. 81:12 Substitution Victor Moses is brought on as a substitute for Hugo Rodallega. 79:33 Assist by Joe Cole. Save by Michael Pollitt. 79:33 GOAL - Didier Drogba:Chelsea 7 - 0 Wigan A goal is scored by Didier Drogba from close range to the bottom left corner of the goal. Chelsea 7-0 Wigan. 79:31 Joe Cole takes a shot. 76:55 Centre by Nicolas Anelka. Close range headed effort by Didier Drogba misses to the right of the target. 76:12 Nemanja Matic produces a right-footed shot from the edge of the box and misses to the right of the target. 73:15 Emmerson Boyce takes the direct free kick. 73:15 Booking Didier Drogba receives a caution for unsporting behaviour. 73:08 Didier Drogba challenges Steve Gohouri unfairly and gives away a free kick. 72:35 Didier Drogba concedes a free kick for a foul on Emmerson Boyce. Mario Melchiot restarts play with the free kick. 71:05 Substitution Mohamed Diame leaves the field to be replaced by Paul Scharner. 69:54 Foul by Ashley Cole on Charles N'Zogbia, free kick awarded. Mario Melchiot restarts play with the free kick. 69:08 Substitution Nemanja Matic replaces Michael Ballack. 67:51 Ashley Cole provided the assist for the goal. 67:51 GOAL - Didier Drogba:Chelsea 6 - 0 Wigan Didier Drogba scores a power penalty. Chelsea 6-0 Wigan. 66:55 Ashley Cole fouled by Emmerson Boyce, the ref awards a Penalty. 66:29 A cross is delivered by Ashley Cole. 64:48 Didier Drogba produces a overhead kick right-footed shot from 6 yards. Save by Michael Pollitt. 64:15 Hugo Rodallega is caught offside. Petr Cech takes the free kick. 62:31 Frank Lampard provided the assist for the goal. 62:31 GOAL - Didier Drogba:Chelsea 5 - 0 Wigan Didier Drogba finds the net with a headed goal from close in. Chelsea 5-0 Wigan. 62:26 The ball is crossed by Ashley Cole. 60:48 Substitution Hendry Thomas joins the action as a substitute, replacing Ben Watson. 60:48 Free kick awarded for a foul by Joe Cole on Maynor Figueroa. Michael Pollitt takes the direct free kick. 60:00 Effort on goal by Didier Drogba from inside the box misses to the right of the target. 57:36 Substitution Branislav Ivanovic leaves the field to be replaced by Juliano Belletti. 57:36 Substitution Joe Cole is brought on as a substitute for Salomon Kalou. 55:58 Branislav Ivanovic provided the assist for the goal. 55:58 GOAL - Nicolas Anelka:Chelsea 4 - 0 Wigan A goal is scored by Nicolas Anelka from deep inside the penalty area to the bottom right corner of the goal. Chelsea 4-0 Wigan. 54:19 Booking Salomon Kalou is cautioned. 53:36 Assist on the goal came from Frank Lampard. 53:36 GOAL - Salomon Kalou:Chelsea 3 - 0 Wigan Salomon Kalou scores a goal from close in to the bottom left corner of the goal. Chelsea 3-0 Wigan. 52:33 Charles N'Zogbia produces a cross, clearance made by John Terry. 51:46 The ball is swung over by Maynor Figueroa. 51:14 Foul by Didier Drogba on Mohamed Diame, free kick awarded. Maynor Figueroa restarts play with the free kick. 50:08 The assistant referee flags for offside against Salomon Kalou. Free kick taken by Michael Pollitt. 49:27 Branislav Ivanovic produces a cross, Charles N'Zogbia makes a clearance. 48:33 Michael Ballack takes the free kick. 48:33 Booking Charles N'Zogbia goes into the referee's book. 48:28 Foul by Charles N'Zogbia on Ashley Cole, free kick awarded. 46:49 Nicolas Anelka is flagged offside by the assistant referee. Michael Pollitt takes the free kick. 46:34 Didier Drogba delivers the ball. 45:00+2:17 The first half comes to an end. 45:00+2:01 The ball is sent over by Steve Gohouri, comfortable save by Petr Cech. 45:00+0:47 Didier Drogba produces a right-footed shot from outside the penalty area and misses left. 45:00+0:36 Frank Lampard delivers the ball, Emmerson Boyce makes a clearance. 44:44 Nicolas Anelka has an effort at goal. Blocked by James McCarthy. Frank Lampard takes the outswinging corner, Mohamed Diame makes a clearance. 44:33 Centre by Florent Malouda, Mario Melchiot manages to make a clearance. Correction - 43:49 Mohamed Diame has an effort at goal. Save made by Petr Cech. 43:49 Mohamed Diame has an effort at goal. Save by Petr Cech. 43:33 Free kick awarded for a foul by Didier Drogba on Emmerson Boyce. Free kick taken by Emmerson Boyce. 42:48 Branislav Ivanovic fouled by Hugo Rodallega, the ref awards a free kick. Petr Cech takes the direct free kick. 42:24 The ball is delivered by Ashley Cole, clearance made by Emmerson Boyce. 41:21 Mario Melchiot fouled by Nicolas Anelka, the ref awards a free kick. Mario Melchiot takes the direct free kick. Correction - 40:09 The ball is sent over by Frank Lampard, Alex has a headed effort at goal from close range which goes wide left of the target. Correction - 40:09 Booking Caution for Steve Gohouri. 40:09 Frank Lampard crosses the ball, Alex has a headed effort at goal from close in which goes wide of the left-hand upright. 40:09 Booking Emmerson Boyce shown a yellow card. Correction - 39:45 Emmerson Boyce challenges Salomon Kalou unfairly and gives away a free kick. 39:45 Unfair challenge on Salomon Kalou by Emmerson Boyce results in a free kick. 39:16 Free kick awarded for a foul by Didier Drogba on Charles N'Zogbia. Free kick taken by Charles N'Zogbia. 35:18 The ball is swung over by Florent Malouda, Michael Pollitt makes a comfortable save. 33:50 Didier Drogba concedes a free kick for a foul on Mario Melchiot. Free kick taken by Mario Melchiot. 33:18 Centre by Didier Drogba, save made by Michael Pollitt. 31:22 GOAL - Frank Lampard:Chelsea 2 - 0 Wigan Penalty taken right-footed by Frank Lampard and scored. Chelsea 2-0 Wigan. 30:18 Sent off Red card for Gary Caldwell. 30:06 Unfair challenge on Frank Lampard by Gary Caldwell results in a Penalty. 27:29 The ball is crossed by Nicolas Anelka, clearance made by Steve Gohouri. 26:12 Centre by Branislav Ivanovic, save by Michael Pollitt. 25:27 Inswinging corner taken left-footed by Florent Malouda from the right by-line to the near post, clearance by Gary Caldwell. 25:20 A cross is delivered by Didier Drogba, Gary Caldwell makes a clearance. 22:55 Unfair challenge on Michael Ballack by Ben Watson results in a free kick. Direct free kick taken by Michael Ballack. Free kick awarded for an unfair challenge on Florent Malouda by Charles N'Zogbia. John Terry takes the free kick. 22:03 The ball is delivered by Mario Melchiot, Michael Ballack makes a clearance. 21:09 Free kick awarded for a foul by Nicolas Anelka on Gary Caldwell. Direct free kick taken by Michael Pollitt. 20:26 The offside flag is raised against Hugo Rodallega. Petr Cech takes the indirect free kick. 17:37 The ball is sent over by James McCarthy, clearance made by Branislav Ivanovic. Correction - 15:54 Alex gives away a free kick for an unfair challenge on Gary Caldwell. Free kick taken by Michael Pollitt. 15:54 Alex challenges Gary Caldwell unfairly and gives away a free kick. Free kick taken by Michael Pollitt. 15:05 Foul by Gary Caldwell on Didier Drogba, free kick awarded. The free kick is swung in right-footed by Frank Lampard. 14:31 The ball is swung over by Maynor Figueroa. 13:33 Foul by Michael Ballack on Charles N'Zogbia, free kick awarded. Charles N'Zogbia delivers the ball from the free kick left-footed from right wing, Alex makes a clearance. 13:22 A cross is delivered by Maynor Figueroa. 12:56 The ball is swung over by Salomon Kalou, Gary Caldwell makes a clearance. 11:22 The official flags Nicolas Anelka offside. Gary Caldwell takes the indirect free kick. 10:33 Corner taken short by Charles N'Zogbia. 10:24 Centre by Charles N'Zogbia, Michael Ballack makes a clearance. 9:49 Salomon Kalou is caught offside. Michael Pollitt restarts play with the free kick. 9:17 Charles N'Zogbia has an effort from just inside the box that misses to the left of the goal. 8:36 Didier Drogba is flagged offside by the assistant referee. Indirect free kick taken by Steve Gohouri. 5:37 Assist by Florent Malouda. 5:37 GOAL - Nicolas Anelka:Chelsea 1 - 0 Wigan Goal scored by Nicolas Anelka from inside the box to the bottom left corner of the goal. Chelsea 1-0 Wigan. 4:17 Gary Caldwell concedes a free kick for a foul on Salomon Kalou. Didier Drogba has an effort direct from the free kick, Ben Watson gets a block in. 4:04 Hugo Rodallega has an effort at goal. Alex gets a block in. 0:34 Foul by Florent Malouda on Mario Melchiot, free kick awarded. Direct free kick taken by Gary Caldwell.